I was informed the bridge was due to be replaced this year. They have been happy to let the planks totally rot through in the past, and they still have not replaced the handrails they removed in 1999. Perhaps they'll turn up one of these years. Lovely and historic but it is dangerous and I absolutely dread using the thing. I hate how the lights always turn off right when I'm about to go down the steps.. The overpass its self seems to be holding but the stairs for me are the real issue, all the ones on the Church side are rotten. Where is this? I have no idea. Glad it's not just me Rob! The Forest Hill end of the bridge is at the bottom of Sydenham Park and it crosses the railway to the Dietrich Bonhoeffer German Church near Dacres and Inglemere Roads. I think I need to re-assess my original criticism of the bridge. I went over a few times today on the way to the gym and there are only a few rotten boards on the church side and 2 or 3 on the top. All of which could be replaced really easily. The reason the bottom ones are rotten are because they basically sit on the ground so are always wet. It's not all bad. Yeh Ben - those rotten boards were just a ploy to try to keep the good people like you on this side of the tracks. But now you've managed to cross over, we need to get it all fixed up so that we can have you back now and again. Due to delays to securing an Asset Protection Agreement with Network Rail to allow work on the footbridge, repairs are unlikely to take place until August and September 2014. The site was investigated in October 2013 and changes to the proposed designs were requested. These new designs have now been completed, but fabrication of the new bridge will not start until the APA is signed. Improvements to the steps will follow, but are subject to separate funding and approvals. Replacing the footbridge deck will require the bridge to be closed for one weekend. So they are going to replace the bridge but not he stairs? What sort of bureaucratic BS is that?? And it costs �330,000 to replace the top bit? I could put something together in the back yard for half the price! I really don't understand this as the rotten steps are the part of the bridge which feel in need of the most urgent replacement. Is the plan to replace the top (and in due course step) sections with something that looks the same, or is accessibility going to be improved? It is really frustrating that the only buggy 'friendly' route over/under the railway involves walking all the way to the south circular. The span is the most attractive feature of the bridge - that's the one part that should remain if possible. I suspect their main concern is that a rotten wooden plank might fall onto the track, which is fine except properly maintaining the flooring wasn't a problem during the previous 100 years or so. (Exactly how old is this bridge?). If the span has to go, surely it would be much cheaper to buy and install an off the shelf structure with circular ramps at either end? the partially disabled and worst of all cyclists as outrageous. And they have the ear of the council and the 2 main societies, so that is why we will most likely be stuck with these stairs for the foreseeable future, just like we are stuck with the 27 steps at the underpass for instants. Lewisham transport department have agreed to carry out a structural examination of the bridge to see if there is a need for urgent repairs. If they conclude that work needs to be done they will pass this on to Network Rail for urgent action (which might help get this moving). The focus has to be on repairing the bridge as it exists today before considering accessibility improvements for disabled users or buggies (cyclists already have a ramp for the stairs on the bridge as I understand it). I emphasised to the Transport Liaison Committee last night the importance of making this safe before classes from Adamsrill and decamped to Willow Way, making this bridge a key walking route for young children and their parents (as well as for a large number of students at FH Boys and Sydenham Girls who are probably still the main users of the bridge). 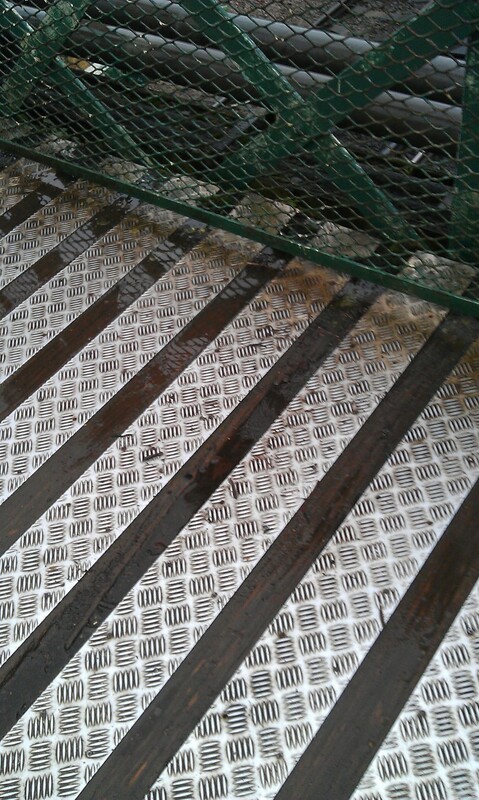 I must say that the condition of the bridge has deteriorated over winter and quite a few boards are rotten. I don�t feel unsafe at all when crossing but it will be an issue if it left a whole lot longer. The cycle "ramp" on the bridge is worse than useless. On the rare occasions that I do cycle that way I just carry my bike up and over but that's when I have my light road bike - there is no way inthe world I would use the ramp if I was, for example, wheeling it over with my daughter in her child seat - it's a narrow gully that is positioned too close to the stair rail (meaning the bike has to be wheeled at an angle) and form memory, on the German Bridge side, only starts a couple of stepps down from the top. I agree that making the bridge safe is the initial concern but it really does need a complete rethink. Looks like someone has been replacing some of the steps and platform planks so the bridge is in better nick at the moment. It's a temporary measure though as they have replaced the planks with untreated pine which will only probably last a few months if it keeps raining.. Good to see some slight repairs done though! Apologies (to those Hinterlanders among us who frequent both forums) for replicating this from the Sydenham Town forum, but it seems that the original post got more responses here. Now that the work on the German Church footbridge has been done, what is the general consensus, is it an improvement? I think the parts of the bridge where the wood has been replaced feel even less secure than before - there is more sense of movement underfoot. The new wood that was put in does not appear to have been sealed/treated in any way and is now cracking in the hot weather; and the girders that were lifted do not appear to have been put back down properly, perhaps contributing to the problem. you mean some emergency basic maintenance has been completed - and poorly going by your pictures. We are still waiting for the replacement bridge due 2013, with handrails and other 19th century innovations.